Our breeding program is a significant part of the DeCoverly Difference. 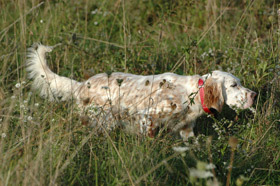 Breeding pairs are matched to breed towards the centerline, standard dog. The system is expensive to maintain and operate as it requires a large number of dogs to make the necessary crosses. It is, however, the best method we know of to consistently produce quality companions for our customers. 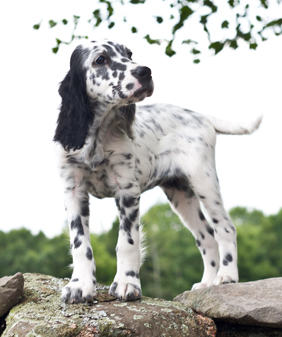 No litters are planned that do not have the potential to produce English Setters for the future of DeCoverly Kennels. Our selections are made on strict criteria. The breeding selection process takes at least two years. We make our initial selections at seven weeks of age. These first selections are made with an emphasis on conformation and personality, as field ability cannot yet be assessed. Youngsters must be selected because of their individual quality, not because they are out of particular dogs. The first six months consists of basic development and socialization. The following six- to twelve-month period is used for beginning exposure to the field and to birds. We look for an inclination to hunt and to point naturally. There is an assessment of the natural balance between independence and a constant awareness of the handler. During the following 12- to 18-month period, (SOME may be later) potential breeding dogs are started in the field with an emphasis on natural ability and particular evaluations of “application”, “nose”, and “brains”. They are also, however, judged on their trainability and biddability. They will be taught coming when called and have their first birds shot for them. When the individual is hunting in the field, being shot over, collar conditioned to come when called, then they are PennHip x-rayed for dysplasia and evaluated for functional structure and efficient movement. This pool of young dogs is where most of our started setters originate, as not all will make our final cut but all will be outstanding specimens. 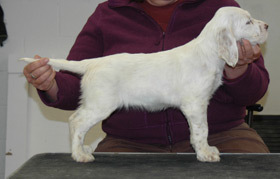 This is a pick female from a recent litter, her name is Gabby. 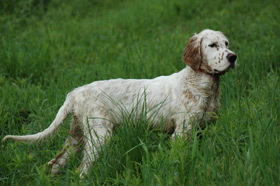 This is Gabby at 5 mos old in the field. Gabby pointing at 9 months.